Enter a whimsical world inspired by nature in Color Yourself to Happiness-an anti-stress adult coloring book of gorgeously detailed illustrations hand-drawn by designer Clare Youngs. Intricately detailed, each one is drawn by hand, featuring exquisite drawings of leaves, flowers, birds, insects, and woodland creatures, such as owls, bears, mice and deer. 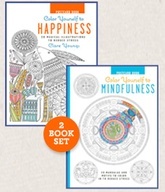 With Color Yourself to Mindfulness, continue to keep the stress low by coloring in these mandalas and motifs! You'll find inner calm quickly by coloring in these exquisite mandalas, based on original artworks by Melissa Launay. Reproduced as re-moveable postcards, you can use them to send messages to your friends, as invitations, or just to display in your home.